The Blackstar HT Stage 100H MkII valve amp head is bundled here with the extremely useful Blackstar FS-14 footswitch giving you easy access .. The Blackstar HT Stage 100H MkII valve amp head is bundled here with the extremely useful Blackstar FS-14 footswitch giving you easy access to the amp’s channels and voices. Blackstar’s award-winning HT Venue range returns better than ever in their MkII iterations and seen here is the innovative and intuitive HT Stage 100 MkII amp head has four EL34 power valves delivering 100 watts of power. 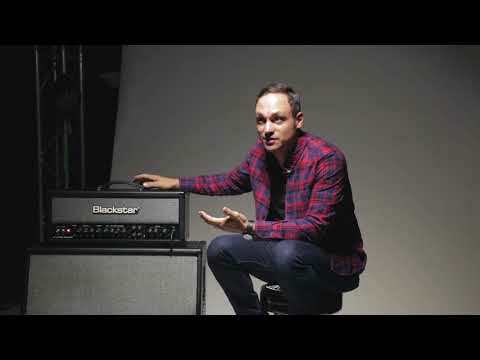 With the HT Stage 100 MkII amp head – the flagship HT Stage amp, Blackstar have added in all the major enhancements requested by guitarists so you get an even more flexible set of features. The Blackstar HT Stage 100 MkII amplifier head is the flagship Stage amp from the new MkII versions of the award-winning Blackstar HT Venue range. For the HT Stage 100H MkII, just enter LISTEN100 and £100 will be knocked off the price of this amp! Giving you easy access to all available Channels and Voices, a global boost function and Reverb switching, the FS-14 is the perfect companion to the Blackstar HT Venue series of amps. Five separate switches clearly labelled Clean, OD 1, OD 2, BOOST and REVERB make it easy to get the sound you need at lightning speed, perfect for use on stage where timing is everything. As its name suggests; the Blackstar HT Stage 100 MkII is the ideal for any stage and it comes complete with 3 channels and 6 footswitchable voices. Making use of a 100W EL34 driven power amplifier, the HT Stage 100 MkII delivers cleans that really pack a punch and some fantastic dynamics. An expanded set of tone controls allow you to tailor your tone so you can cut through any mix when playing in your band while you enjoy beautifully cleans and some amazing “classic crunch” and “super saturate lead” modes courtesy of the patented ISF (Infinite Shape Feature) equipped overdrive channels. The Blackstar HT Stage 100 MkII’s clean channels provide great voices, offering pristine, clean tone quality and great flexibility with one voice based on a classic American circuit and the other giving you the best of classic British tone. Two Overdrive channels provide you with great, distinct voices that are richer and fuller than before. Thanks to its unique preamplifier and power amplifier shaping techniques, unlike other designs, the HT Stage 100 MkII gives you some great high gain tones but with none of that unwanted top-end fizz, ensuring your sound stays clear, focused and natural sounding. With the included 2-way footswitch you can enable any of three different channels and six footswitchable voices. The Blackstar HT Stage 100 MkII also features a switchable power reduction circuit that takes the power down to 10 percent of its full 100w potential. This means that you can enjoy the full tonal depth that the EL34 power stage provides, with the distinctive sound of power valves being pushed, at any volume – perfect for when you want to practice at home or even use the HT Stage 100 MkII for recording. The Blackstar HT Stage 100 MkII’s built-in, natural sounding digital reverb can be fully adjusted with the Reverb control found on the front panel while a switch locate on the real panel allows you to select between “Dark” and “Light” reverb settings; Dark being a “room reverb” and Light giving you a “plate reverb” sound. Not just a fantastic stage amp, the Blackstar HTV-112 MkII amplifier head is great for the studio too. Giving you the ultimate in convenience, the Blackstar HT Stage 100 MkII has a USB connector allowing for up to 4 channels to be sent. On the rear of the HT Stage 100 MkII you will find a stereo jack socket and a balanced XLR, allowing the speaker emulated signals to be connected to external devices, great for practicing, live situations and furthering your recording options. More compact and portable than its previous iteration, the HT Stage 100 MkII is the perfect amp for the gigging guitarist while retaining all its great sound and more! With 100 watts of valve power it is everything you need for putting on some great live performances. Making it so you can use it at home, its Power Reduction feature takes the HT Stage 100 MkII down to 10 percent of its full power so you get the same, beautifully full valve sound even at low volumes. Providing huge tonal range and depth with fantastic, unmistakable genuine valve sound and USB recording options – the Blackstar HT Stage 100 MkII covers all the bases for gigging and recording guitarists.